“Life in Austin (1)” introduces some of the themes on which I will here elaborate. But there is more to say about Austin than greenness for its own sake, growth to stoke the egos of elected officials and other smug Austinites, the horrendous traffic that ensues, and the diversion of precious road space to Austin’s powerful (though minuscule) cadre of bicyclists. The last-mentioned are not content to stay in their lanes. When they are not riding abreast and riding the white line to force drivers to swerve around them, they are waiting for lights to change (when they do wait, that is) by parking themselves square in the middle of traffic. The purpose of this maneuver, of course, is an ill-advised attempt to irritate drivers. Ill-advised because many drivers, who have a distinct weight advantage, make it a point to harass cyclists. I would not be surprised to learn that the occasional cyclist who is picked off by a never-discovered driver was a casualty of a poorly calculated near miss. Austin’s self-designated status as the “Live Music Capital of the World,” to which I adverted in part one, is a matter of misguided opinion. How does one determine the “most musical” city and, more fundamentally, what counts as music? My idea of music isn’t a lot of twenty-somethings making a lot of noise that is heard mostly by other twenty-somethings. (Nor is it the corny trash for thirty-to-ninety somethings that seems to be Nashville’s staple.) Give me a first-rate symphony orchestra that plays (mostly) music composed before 1900 and a bevy of chamber ensembles that do the same. By that (correct) standard, there are dozens of cities that could claim the title of “Live Music Capital of the World,” but Austin wouldn’t be among them. You may also have heard that Austin is a “beautiful” city. And that would be true, if only its parks and tonier residential areas are considered. But most of Austin — that part of it which hasn’t been paved over in a vain attempt to move traffic — is flat, brown much of the year (because of a continuing drought), and occupied by ugly houses and commercial buildings. Austin’s downtown area, which once was dominated by the beautiful Capitol of Texas, is now dominated by the random and graceless spires of high-rise buildings, to which the more affluent denizens of Austin have fled so that they have a place to park when they are conducting business in downtown Austin. It begins with (1) driving in the middle of unstriped, residential streets, even as other vehicles approache. This practice might be excused as a precautionary because (2) Austinites often exit parked cars by opening doors and stepping out, heedless of traffic. But middle-of-the-road driving occurs spontaneously and is of a piece with the following self-centered habits. (3) Waiting until the last split-second to turn onto a street. This practice — which prevails along Florida’s Gulf Coast because of the age of the population there — is indulged in by drivers of all ages in Austin. It is closely related to (4) the habit of ignoring stop signs, not just by failing to stop at them but also (and quite typically) failing to look before not stopping. Ditto — and more dangerously — (5) red lights. Not quite as dangerous, but mightily annoying, is the Austin habit of (6) turning abruptly without giving a signal. And when the turn is to the right, it often is accompanied by (7) a loop to the left, which thoroughly confuses the driver of the following vehicle and can cause him to veer into danger. The imperial prerogative — I drive where I please — also manifests itself in the form of (9) crossing the center line while taking a curve. That this is done by drivers of all types of vehicle, from itsy-bitsy cars to hulking SUVs, indicates that the problem is sloppy driving habits, not unresponsive steering mechanisms. Other, closely related practices are (10) taking a corner by cutting across the oncoming lane of traffic and (11) zipping through a parking lot as if no child, other pedestrian, or vehicle might suddenly appear in the driving lane. At the other end of the spectrum, but just as indicative of thoughtlessness is the practice of (12) yielding the right of way when it’s yours. This perverse courtesy only confuses the driver who doesn’t have the right of way and causes traffic to back up (needlessly) behind the yielding driver. Then there is (13) the seeming inability of most Austiners to park approximately in the middle of a head-in parking space and parallel to the stripes that delineate it. The ranks of the parking-challenged seem to be filled with yuppie women in small BMWs, Infinitis, and Lexi; older women in almost any kind of vehicle; and (worst of all) drivers of SUVs –(14) of which “green” Austin has far more than its share on its antiquated street grid. It should go without saying that most of Austin’s SUV drivers are (15) obnoxious, tail-gating jerks when they are on the road. Contributing to the preceding practices — and compounding the dangers of the many dangerous ones — is (16) the evidently inalienable right of an Austinite to talk on a cell phone while driving, everywhere and (it seems) always. Yuppie women in SUVs are the worst offenders, and the most dangerous of the lot because of their self-absorption and the number of tons they wield with consummate lack of skill. Austin, it should also go without saying, has more than its share of yuppie women. None of the above is unique to Austin. But inconsiderate and dangerous driving habits seem much more prevalent in Austin than in other places where I have driven — even including the D.C. area, where I spent 37 years. My theory is that the prevalence of bad-driving behavior in Austin — where liberalism dominates — reflects the essentially anti-social character of liberalism Despite the lip-service that liberals give to such things as compassion, community, and society, they worship the state and use its power to do their will — without thought or care for the lives and livelihoods thus twisted and damaged. It should be unnecessary to add that the 16 egregious practices described above are especially prevalent among Austin’s self-important, SUV-driving, guilt-trip-Democrat-voting yuppies. What is the cost of living in Austin’s smug, raucous, clogged, irritating, and (mostly) ugly environs? It isn’t cheap, because Austin levies the highest sales-tax rate permitted by Texas (8.25%), and routinely raises property assessments by 10% a year (the maximum allowable by law), while also raising property-tax rates (just enough to evade approval at the ballot box). So, if you’re thinking of living in (or near) Austin, consider yourself warned. As for me, I’m out of here as soon as my 90-something in-laws see fit to quit their earthly abode. Almost two-thirds of the country’s million-pound earners disappeared from Britain after the introduction of the 50 [percent] top rate of tax, figures have disclosed. It happens here, too. 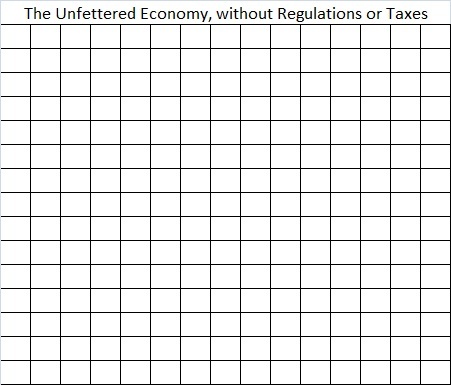 For example, the net flow of persons among States (i.e., pattern of inter-State migration) is strongly determined by the relative tax burdens of the States (including taxes imposed by local governments). Take California (please). In 2010 alone, the Golden State’s heavy tax burden — 11.2 percent vs. the national average of 9.5 percent — cost it 54,000 residents. And California is not the most repulsive of States (“tax-wise”). That “honor” goes to New York, with a burden of 12.8 percent in 2010 — a burden that cost the Empire State 66,000 residents in that year. Then there is Wisconsin — with only 1/6 the population of California — which lost 33,000 current and prospective residents because it is in the North Central region and has a tax burden of 11.1 percent. Current and prospective residents and businesses are driven away by high taxes and other unfavorable conditions (e.g. unionization). Instead of paring government and taking other steps to make the State more attractive (e.g., playing tough with public-sector unions), taxes are raised on remaining residents and businesses. More residents and business are driven away. Some amount of paring may eventually occur, but taxes remain disproportionately high (and other unfavorable conditions usually persist), so more residents and businesses are driven away. Detroit — which lost more than 60 percent of its population between 1950 and 2010 — is a prime example of a jurisdiction in a death-spiral, but it is far from the only one. But voting with one’s feet, which works on the municipal and State levels, does not work on the national level. And the proponents of Big Government understand that. 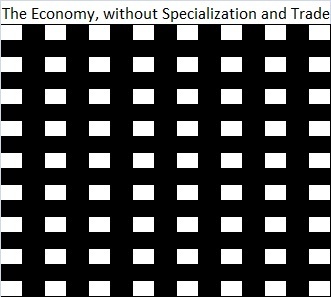 It is a sad fact that, for most citizens, the cost of fleeing the country for a better place (if one can be found) would far outweigh the additional burden of higher marginal tax rates, higher rates on capital gains, the perpetuation and expansion of “entitlements,” and the ever-growing volume of regulations (which are taxes in a different guise). What the proponents of Big Government do not understand — or do not care about — is that they are killing the goose that lays the golden eggs. When people cannot reap the hard-won rewards of their labors and their investments, they labor and invest less. The result is slower and slower economic growth, and the imminent European “nirvana” so devoutly wished by proponents of Big Government. I began with Census Bureau estimates of State-to-State migrations in 2010. I derived estimates of in- and out-migration for each State and the District of Columbia. The “turnover” rates for Alaska and the District of Columbia proved to be much higher than the rates for the other 49 States. 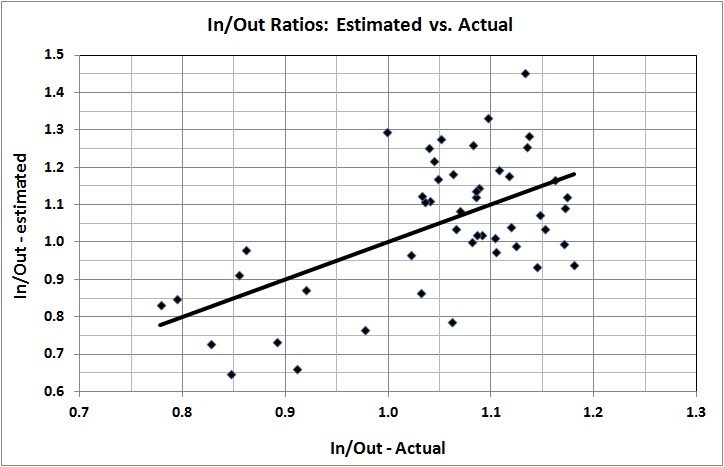 Preliminary analyses of the relationship between In/Out ratio and key variables (e.g., tax burden) confirmed that the inclusion of Alaska and D.C. in the analysis would bias the results, so I dropped those two entities from the analysis. According to the equation, a North Central State with a tax burden of 10.2 percent (the average for North Central States) would have an In/Out ratio of 0.82; the average for North Central States is 0.83. A State in another region with a tax burden of 9.4 percent (the average for all other States) would have an In/Out ratio of 1.08; the average for States not in the North Central region is 1.08. The top 6 States have something extra going for them; the bottom 9 States have something extra going against them. The extras could be an especially hospitable or inhospitable business climate, climatic and/or geographical allure (or lack thereof), cost of living, unemployment well above or below the national average, the political climate (“Blue” to “Red” shifts prevail), or something else. Whatever the case, I am easily persuaded that New York (where I have lived and run a business), Michigan (my home State), California (a well-known basket case), Nevada (ditto), New Jersey (ditto), and West Virginia (with which I am all too familiar) have a lot going against them, even when it is not an excessive tax burden. MR. GREGORY: Let me, let me ask you about the role of government. You’ve said about taxation, in a way that doesn’t minces words, the following: “Taxation is immoral,” you told the Libertarian Party News. Would you scrap the tax code altogether? REP. PAUL: That would be a pretty good idea, a pretty good start. I, I can qualify it if I’m allowed. Taxation is theft when you take money from one group to give it to, to another, when you, when you transfer the wealth. Now, taxation could be accomplished with user fees and, you know, highway fees and gasoline taxes and import taxes. But the income tax is based on the assumption that the government owns you, owns all of your income and provides the conditions on which they allow you to keep a certain percentage. That, to me, is immoral, and the founders didn’t like it. That’s why the Constitution had to be amended in 1913. Not eloquent, but fairly near the mark. Government has essentially one legitimate function, which is to protect citizens from predators, foreign and domestic. That covers national defense and domestic justice (including the enforcement of contracts and prosecution of fraud). Those functions could be provided by private agencies, but — because of the danger of warlordism — they are best provided by government and funded from a true flat tax. A proper division of labor would place defense in the hands of the national government and justice in the hands of State and local governments. This would eliminate the ability of the national government to criminalize conduct for the sake of imposing its will on everyone. For the same reason, the provision of justice should be devolved to the lowest possible level within each State. I see no need for State and local governments to do more than provide justice, though the government of a very small community — say, not more than 150 persons — might legitimately do more if authorized by the community, following rules explicitly and regularly adopted by consensus. Expanding the scale of government action beyond the jurisdiction of a small community courts runaway statism and precludes the provision of services (utilities, highways, etc.) by private actors, which are subject to discipline by market forces. Other than that, I found the punctuation and spelling to be impeccable. As for the question posed in the title of this post: theft, all theft, because even essential protective services are not funded equitably. 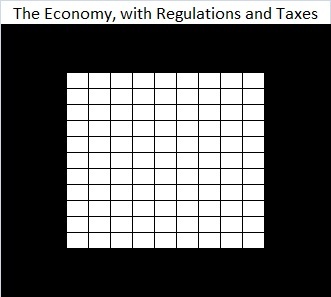 And so, with regulations and taxes as they are today, the economy realizes a fraction of its potential output.